Purchase "Shadows, Supernatural Tales by Masters of Modern Literature"
A candle flickers as an unnatural form floats through a darkened room and leaves the imprint of a human body on a perfectly made bed. Frightened, a wayward traveler flees a dilapidated inn and its restless spirits. Vowing to never return, the traveler has escaped. Many horror readers avoid early 20th century literature like it’s a lumbering zombie that is too decomposed to offer a real scare. Readers may flirt with literary writers by reading a story here or there, but then they rush back to contemporary tales of gruesome hillbilly cannibals or atomic-powered killer zombies on speed. To counteract the reluctance of modern readers to dive into early literary horror, Editor Robert Dunbar has gathered ten tales penned by some of the greatest writers of the early Twentieth Century. The volume, Shadows: Supernatural Tales of Modern Literature, offers a unique glimpse into early literary horror fiction. These are writers that just happened to write a horror tale here or there. And they wrote some humdingers. Reader, beware, these are dense tales from a time before televisions, radios, computer games, and iPads when common folk and landed gentry would retire to gaslit rooms with a brandy or a cup of cocoa and read for an entire evening. These were ordinary people that occasionally liked to be frightened by a tale of ghostly visitations or a haunted house on barren Scottish moors. The stories feature well-crafted descriptions, revealing internal monologues, and the occasional, and well-timed insertion of narrator commentary. As such, the tales require effort (and sometimes patience) for a modern reader but in the final analysis, each story is a story very well told. 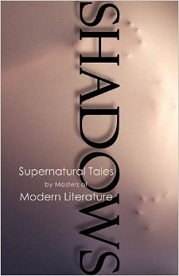 Shadows: Supernatural Tales of Modern Literature features many eminent writers such as Virginia Woolf, Edith Wharton, D.H. Lawrence, Willa Cather, Henry James, and many more. They introduce to the slow-burn horror of the early Twentieth-Century. Here, we find haunted houses, ghosts that possess the living, sexual rapacity, possession, murder, and schizophrenic doppelgangers. And, contained in these pages are two stories considered by many scholars to be the best ghost stories ever written: Oh, Whistle, and I’ll Come to You, My Lad by M.R. James and The Beckoning Fair One by Oliver Onions. One must remember that these were contemporary writers writing for a contemporary audience. Taken with this knowledge, one realizes that the readers actually lived in drafty and darkly lit manor houses, remote farms in the countryside where the wind whipped through fields of grain, and even in London’s East End tenements where Jack the Ripper had prowled only a few decades before. Scary stuff, indeed. This book is required reading for all horror fans. Grab it and lock yourself in a room lit by a flickering fire while sheets of rain pound against your windows. Wait for that hair on your neck to creep with electricity and then stand on end. Pray that you survive until dawn, and hope that there is a second volume in this series.